I did some some throwing today, starting with large serving bowls, then mugs; by the time I got to sugar and creamer sets my left wrist was feeling a little twinge. 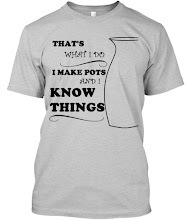 Luckily there's more than one way to make pots! These wonky little guys are slab built. I like handbuilding as much as I like throwing, actually. It's slower and more contemplative, and can produce some engaging shapes. "Slower" is not always a plus, of course, but I am looking at the wrist-twinges as a blessing in disguise: they give me a reason to switch to my less-productive mode. I like the little handbuilt guys. They're most individual with lots of personality! I can only throw for a short time with no more than three pounds if clay, due to old injuries! I like hand building because it has a continuity...no stopping to let things set up, trim....etc. It seems like the zen of pottery works no matter how we're creating these pieces.